“The Girl Who Died” is a deeply peculiar episode in this most eccentric of seasons. On the surface it recalls last year's divisive “Robot Of Sherwood” – a daft historical “romp” (oh how loaded that word has become for Who fans) with little regard for historical accuracy. On the other, it’s clearly meant as a major turning point in the life of the Twelfth Doctor. Before all that, however, we’re treated to a gently funny adventure with shades of Monty Python and Horrible Histories. The Vikings here are a broadly-sketched lot – Maisie Williams' Ashildr aside – but it doesn't matter. This is no more a serious Norse saga than Who's original comedy historical, “The Romans”, was an accurate portrait of life in the Empire. Crucially, it is genuinely funny and packed with sharp lines and neat ideas. Also, how lovely to be outdoors! The Moffat era as a whole – and this season in particular – has often felt claustrophobic. It’s refreshing to be in the fields and forests, though I do wish the production team would dial back on that bluey-green grading. The last few episodes have occasionally looked like someone has smeared detergent across the screen. This week’s alien race – the Mire – aren’t terribly impressive. The armoured suits are fun, and the make up once their helmets came off well-realised, but there’s no real sense of threat. That’s fitting given that the Doctor's solution hinges on them being all mouth and no space trousers, but it’s hard to believe that he was genuinely troubled by them earlier on. More grating was the return of the Doctor’s ability to speak baby. It’s deployed here to more serious effect, but that doesn't really work... The gravitas of the Doctor asking “do babies die with honour” is hard to swallow when it's been spurred on by him translated an infant’s gurgling. Where the episode really works, however, is in the scenes between the Doctor and Ashildr (Maisie Williams). Capaldi’s performance has been funnier and more obviously “Doctory” this season, but it’s also been increasingly clear that his is a selfish hero. As his testing of the theory that ambiguously led to O’Donnell's death in “Before The Flood” showed, this Doctor is concerned primarily with protecting the lives of the people he knows. “I lost someone who matters to me,” he says at one point here, and he later predicts Clara's potential demise and it’s all about how he will feel when it happens. But then he meets Ashildr, and there’s a connection and her death shakes him to his core. It sparks the memory of saving Caecilius at Pompeii and reminds him that he can do pretty much anything he likes. There will be consequences (more on that next week...) but it gives him a purpose again. “I'm the Doctor, and I save people” feels like a moment of real triumph and realisation. Shame that it was plastered all over the trailers. Also, how lovely that the reason he “chose” his current face wasn't a convoluted sci-fi explanation. The “Fires Of Pompeii” callback could have been another fannish indulgence (in a season that's brimming with them), but instead it’s given a moral purpose. The angry, detached Doctor we saw last season is all but gone now, which will annoy some, but this episode does a good job of smoothing over the transition and making it credible. Maisie Williams is, of course, terrific. If her character hadn't worked, the episode would have fallen apart, but Ashildr is hugely likeable. She's fierce, but not one-dimensionally angry, brave but not unafraid. She rather steals the episode from Clara (who is relegated to a slightly thankless supporting role here) and that final scene, with the world spinning around her as she embraces her new life is utterly gorgeous and affecting. We’ll see her again, and soon. But how will immortality have changed her? So, is Ashildr the hybrid that Davros was talking about back in “The Witches Familiar”? "There was a prophecy, Doctor, on your own world. It spoke of a hybrid creature. Two great warrior races forced together to create a warrior greater than either. Is that what you ran from Doctor, your part in the coming of the hybrid?" That's certainly the implication here. And who knows what suddenly becoming immortal will do to her. This year is starting to recall the Melody Pond storyline from season six, with an ordinary human woman being transformed into something more. How and when, exactly, does the Doctor find the time to hack the Maya leader's teleporter? Doctor Who airs on Saturday evenings on BBC One in the UK and BBC America in the US. For more on top sci-fi TV shows like Doctor Who, subscribe to SFX. 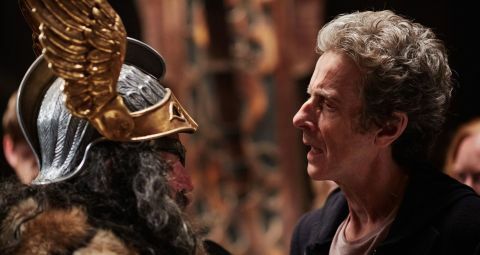 The Doctor and Clara try to save a Viking village from an alien army.